Google My Business (GMB) is a free tool that lets you manage how your business appears on Google Search and Maps. It let’s you maintain accurate business information like your business name, location, and hours. It also lets you monitor and reply to customer reviews, add photos of your business, learn where and how people are searching for you, and more. And, since one in two people who conduct a local search (i.e. “restaurants near me”) visit a store that day, it is critical that the information about your business on Google is as accurate, complete, and optimized as possible. Step 5: Choose if you want your business location to appear on Google Maps. Enter your business address, then click Next. Note: If you also serve customers outside your business address, you’ll have the option to list your service areas as well. At the bottom, click I deliver goods and services to my customers Next. List your service areas, then click Next. Step 1: Log into Google My Business and choose the business you want to verify. Step 2: Make sure your business address is correct. Optional: Add a contact name — that’s who the postcard will be addressed to. Google lets some businesses verify their location by email. If you’re eligible, you’ll see the “Verify by email” option when you start the verification process. Once you’ve verified your business, it’s time to complete your profile. Making sure this information is accurate is very important, and keeping it updated with fresh content will ensure that you get the most out of this listing as possible. Go to the Google My Business dashboard, click the listing you’d like to edit, select “Info” on the left side of the screen, and then choose a section to fill out or update. Add as much information and media as you can. You should include a business profile photo, all of your service areas (be specific), your hours, attributes (e.g. “wheelchair accessible,” “free wifi”), the day and year you opened, and a public phone number and website URL. Your business will look best on Google if you add category-specific photos. These photos spotlight features of your business that your customers use when making purchasing decisions. Photos you add can also help differentiate your business on Google. Learn more about adding photos to your local business on Google. Exterior photos Exterior photos help customers recognize your business as they approach from different directions. Add at least 3 great exterior photos to help customers recognize your business. 1. Capture a photo from each direction that customers might approach your business. 2. Try uploading photos that show your business at different times of day. Interior photos Interior photos help your customers get a feel for the ambiance and decor of your business. Add at least 3 great interior photos to show customers what your business feels like inside. 1. Capture photos that truthfully show what it’s like to stand inside your business as a customer. 2. Capture the atmosphere of your business in your photos. Product photos Great photos of representative or popular products give customers a better understanding of the kinds of goods you offer. Add at least 3 photos of products that you sell. 1. Showcase the items that are most popular for your business. 2. Try taking evenly lit photos of your products. Photos at work Photos help customers quickly understand the type of work you do. Add at least 3 photos that are representative of the services you offer. 1. Capture photos of your team providing different types of service to customers. 2. Capture photos of the speciality services you deliver. Food & drink photos Food & drink photos add color and detail to your menu and help customers plan where to eat. Add at least 3 photos of the food or drinks you serve. 1. Showcase the food items that are most popular for your business. 2. Try taking evenly lit photos of your food items. Common areas Photos of your common areas help attract customers who are planning business or leisure travel. Add at least 1 photo of each of your common areas. 1. Add at least one photo of each common area (for example, spa, gym, or breakfast room). 2. Capture the atmosphere of the common area in your photos. Rooms Customers rely heavily on photos of guest rooms when deciding where to book their next hotel for business or leisure. Add at least 3 photos of your most popular guest rooms. 1. Try showcasing all the different types of rooms that you offer to guests. 2. Capture photos that truthfully show what it’s like when you are in the room as a guest. Team photos Team photos are important to present a more personal side of your establishment. Add at least 3 photos showing your management team and your employees. 1. Show something a little less formal to humanize your business. 2. Show yourself and any staff to highlight your personalities and give potential clients a feel for what you’re like. Customer reviews can make or break your online reputation. Google My Business not only lets you get online reviews, but also respond to them. Did you know that one of the best ways to encourage future customers to leave a positive review is by responding to reviews that are already out there? Not only does a response show the original viewer that you’re thankful for their support, it also makes that positive review stand out and influences other customers to leave their own review. 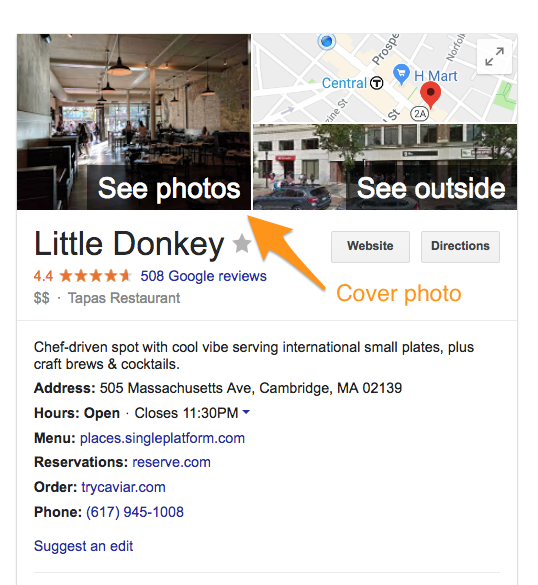 Your customers are busy, just like you so, it’s a good idea to link directly to your Google My Business review form to make it as easy as possible for your customers to leave you a review when you request it. GMB is a free tool, that lets you control how your business appears on Google Search and Maps. It can help your local SEO ranking and allows you to obtain and respond to online reviews. If you operate your business from a physical location, your business is probably already out there and may already have reviews on it. Do you need to claim and verify your business? Yes, otherwise, you have no idea what others may do to your online reputation. If you need any help you can always contact us, or learn more about how we can help with your online reputation management.